Producers are looking beyond the traditional markets to sell their produce, the latest idea being milk vending machines. The squeeze on margins is prompting more and more producers to look beyond traditional routes to market, especially in the dairy sector. 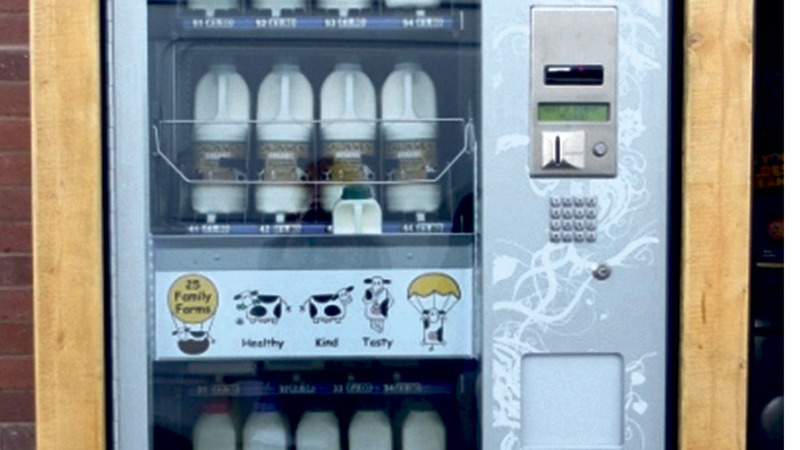 Vending machines have become increasingly popular in the last year, with dairies of all sizes installing units to dispense raw milk. And there is also more consideration being given to small on-farm processing plants, which could allow some farmers to shift additional volume to a different market. Tom Sharman, who runs a 600-head herd of Montbeliardes cattle, installed his own automatic milk vending machine in a bid to cut out the processor and ‘get a fair return’ on the milk he produced. He said the milk he was selling to the supermarkets appeared at a slight loss, but had made a slight profit on the milk sold through the vending machine. Mr Sharman, of New Holbeck Farm, Southwell, Nottinghamshire, said customers were buying about 50 litres priced at £1 per litre each day. In the future, the farmer said he would look into yoghurt and cheese production. He is also working on gaining organic accreditation in order to increase his margin. Charlie Wray and son Tom, of Wayside Farm, Kings Langley, Hertfordshire, started direct selling raw milk from their pedigree Jersey herd to the public at the end of September 2015 and have been successfully selling about 110 litres priced at £1.20ppl a day. Popular farm vending machines selling a variety of produce have also been rolled out across central Scotland by Euan and Pete Grewar, partners of the Grewar Farming enterprise based at East Ardler, near Blairgowrie. North Yorkshire dairy farmer Isaac Lancaster said he had been inspired to look into milk vending machines after meeting a farmer selling 6,000 litres a day at the equivalent of £1ppl, at the Agrofarm trade show in Moscow. Mr Lancaster said the machines would sit well in villages and allow farmers to charge a fair price for their milk, rather than producing milk at a loss. The benefits of smaller scale production were debated at the Oxford Real Farming Conference last month, where Simon Fairlie, who runs a micro-dairy in Dorset, said the dairy industry must stop driving the notion that ‘bigger is better’ and look at smaller producers as efficient and viable businesses. “There is nothing unproductive or inefficient about small-scale production,” he said. “We are obsessed with getting bigger and bigger but it is not working,” he added. Consultant Anthony Prowse said many farmers were considering setting up their own dairy processing unit, but were scared of taking the leap. Mr Prowse, who supports farmers to get their plans off the ground and currently helps Ashclyst Farm Dairy, Devon, with its 10,000-litre-a-week organic unit (featured in Farmers Guardian on January 22), said there were several things which needed consideration before setting up.